An inexplicable epidemic in Central America, where more than 16,000 people — mostly sugarcane workers — have died from incurable chronic kidney disease. NBC's Kerry Sanders reports from Nicaragua. CHICHIGALPA, Nicaragua – You won’t see a road sign pointing to “La Isla de Viudas,” or “The Island of Widows,” as it’s not the community’s official name. It’s a nickname born from a horrific body count. In the past 10 years, it’s believed that hundreds, if not thousands, of residents of Chichigalpa — mostly male sugarcane workers — have died from chronic kidney disease, or CKD. That in a city of nearly 60,000, roughly the size of Ames, Iowa. The mysterious and hidden epidemic, first highlighted by the Center for Public Integrity, has claimed thousands more lives across Central America. In El Salvador and Nicaragua alone, the number of men dying from the excruciatingly painful disease has risen five-fold in the last two decades. High rates of CKD also have been found in rural villages in India and among the rice paddies of Sri Lanka. Sacorro Mendez Flores, who lives in the “La Isla” district of Chichigalpa, remembers when her son first fell ill. Jorge Luis Silva didn’t look sick at first, but inside he was dying. His kidneys struggled to filter waste from his body, to no avail. Five months ago, Flores buried him. 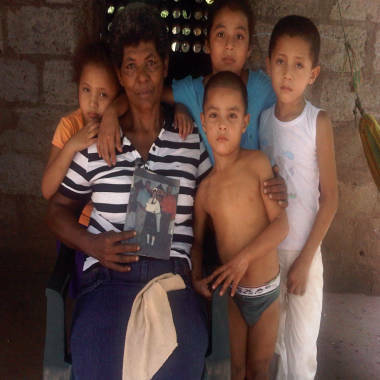 Sacorro Mendez-Flores, surrounded by her grandchildren, holds a family photo. The resident of Chichigalpa, Nicaragua, lost both her son and husband to chronic kidney disease. Researchers are searching for answers about why this disease is ravaging not only the bodies of its victims, but the communities they leave behind. More than 20 million Americans aged 20 and older have chronic kidney disease, according to the Centers for Disease Control and Prevention. In developed countries like the U.S., CKD often goes hand in hand with obesity, diabetes and hypertension. With treatment, including dialysis and kidney transplants, many with the disease survive. The CKD plaguing parts of Central America, however, is something scientists have never seen before. Workers in Central American sugarcane fields are dying of chronic kidney disease at an astonishing rate and experts are unable to say why. And with little or no access to the life-saving treatments available in the developed world, a CKD diagnosis is often tantamount to a death sentence. Many in Chichigalpa believe that the root of the disease lies in chemicals sprayed in the sugarcane fields while men are working, or seeping into the water supply. A spokesperson from the sugar industry says the chemicals used are standard fertilizer and are not used to excess. Science, so far, points to a more complicated answer. The research team from the Boston University has linked the disease in Central America to strenuous labor, dehydration and environmental conditions in which chemicals may play a role. That theory was supported by the group’s most recent study, which found “markers” of kidney damage in adolescents as young as 12 in affected communities. Thousands of miles away, research in Sri Lanka’s affected communities also indicates chemicals may play a key role in the illness devastating communities there. As reported last month by the Center for Public Integrity, the country’s health ministry and World Health Organization announced in June that a years-long study had identified chemicals thought to be an essential cause of the disease: cadmium and arsenic. Both are heavy metals found in fertilizers and pesticides that can cause an array of health effects, including the type of kidney damage ravaging communities in Sri Lanka and Nicaragua. While most of those tested had lower levels of the toxic elements than officially designated as dangerous by the United Nations, researchers believe that long-term exposure, likely through the food chain, may explain the high incidence of CDK. Why are thousands of sugarcane workers dying from chronic kidney disease each year? Sasha Chavkin, of The Center for Public Integrity, discusses the search for the cause of this mysterious epidemic. The findings, due to be officially released in October, represent a potential breakthrough in the research about CDK worldwide, including the epidemic in Nicaragua. Researchers in Central America have not pinpointed a chemical cause. But the new research on adolescents indicates the kidneys of those going into the fields may already be damaged, making the long days and repeated dehydration in the fields potentially deadly. Some experts also suggest that sugarcane workers may also unwittingly be harming themselves as they struggle to stay hydrated while cutting up to 11 tons of cane a day by hand. For a refreshing pick-me-up, they occasionally slice a stalk of cane, peeling back its “bark” and sticking it in their mouths, where it produces a sweet sugary liquid. But investigators now wonder: Could that constant flow of sucrose, combined with 90-plus degree temperatures and severe daily dehydration, be a deadly cocktail that slowly brings on CKD? Whether or not sugar consumption plays a direct role in causing the Central American form of CKD, activists say it is a thread that connects the disease to its northern cousin. In the U.S., rampant sugar consumption – Americans eat an average of 22.2 teaspoons of sugar per day according to the American Heart Association—drives many of the diseases linked to CKD, including diabetes and hypertension. And with recent steep increases in the price and demand for sugar, more people are working longer hours in the sugarcane fields of Central America. In 2011, the U.S. imported 330,000 metric tons of raw sugar from Central America, or nearly one-quarter of total raw sugar imports that year, according to the United States Department of Agriculture. The sugar industry, however, rejects suggestions that it is causing the epidemic of CKD among workers at its mills and plantations. Amador also speculated that active volcanoes in the region could have contaminated the water supply. But he admits he does not know why so many have died from CKD. No matter what the research finds, Central America is unlikely to curb its cane production anytime soon. The world market for sugar is strong, and the industry receives direct help from abroad. The International Finance Corp., the private-sector arm of the World Bank, has provided loans of more than $100 million to promote production and biofuel in Nicaragua in recent years. Though the loans went to two plantations whose workers have been heavily affected by kidney disease, they were approved without formal consideration of the disease because the IFC did not find a link between the cane fields and CKD, according to the Associated Press. After workers complained about the loans, the IFC helped to negotiate an $800,000 donation to sponsor the ongoing Boston University study, the Center for Public Integrity reported. The money was provided by Nicaragua Sugar Estates Limited, a major sugar producer in the west of the country, part of more than $4 million it has committed toward research and community development in recent years. But for many in Chichigalpa, the results of the research – whatever they may be – will come too late. Like most of the men in this community, Maximiliano Lopez, spent years in the fields cutting sugarcane. He began at 5 a.m., when the air was cool, and continued to work as the sun beat down, sometimes logging 14 hours a day. Then he was informed he had CKD. In his own words, Maximiliano Lopez describes an average day in the life of a sugarcane cutter and how he's coping with the chronic kidney disease that he expects will soon kill him. Even after his diagnosis, which bans him from working in the fields or at the mill, the muscular 32-year-old said he used a friend’s identification to return to cutting cane. Nicaragua is the second-poorest country in the Western Hemisphere, he explained, and many workers continue to work the harvest after being diagnosed with kidney disease because it is the only work they can find. But, as Lopez and other cane workers eventually discovered, short-term survival may mean leaving behind the families that they labored so mightily to support.